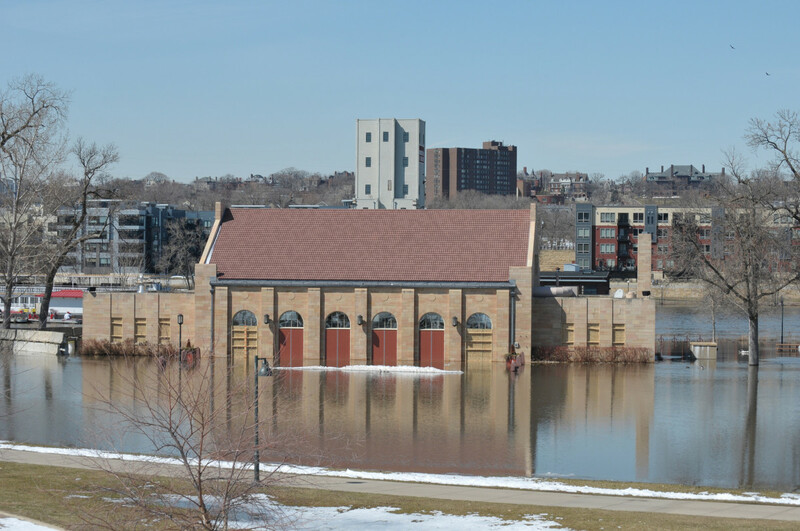 Buildings of Harriet Island flooded during spring of 2011. 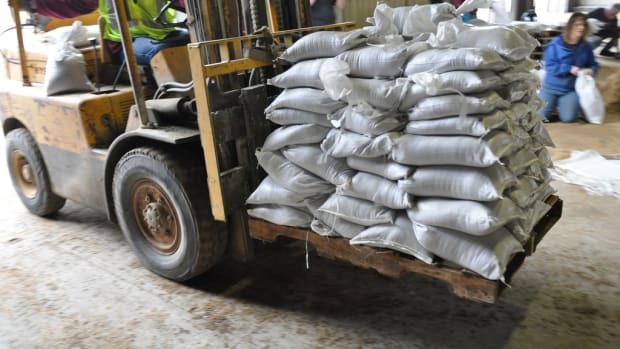 A local flood emergency has been declared by the City of St. Paul in advance of spring flooding, which is forecast to ramp up this weekend into next week. The declaration readies the city to act and protect flood-prone residents and infrastructure in the event the Mississippi River rises above flood stage, which is a foregone conclusion at this point. The National Weather Service, as of 1 a.m. Thursday, measured the Mississippi River at St. Paul at 8.1 feet. Flood stage is at 14 feet, and the river is expected to rise to around 17.5 feet by next Wednesday evening, which will cause major flooding. What effect does that have? At 13.3 feet, water begins to impact Water Street. At 14 feet, parts of Lilydale Park begin to flood and at 17.5 feet Harriet Island begins to submerge. Once the river reaches 18 feet, Warner Road may become impassable. Additional rises are possible beyond next Wednesday, the weather service says. There is a chance for rain over the weekend but forecasters don&apos;t believe it&apos;ll be heavy enough to impact the flood threat beyond what it already is. Rain later next week is possible, but any impact on the flooding is too far away to determine. 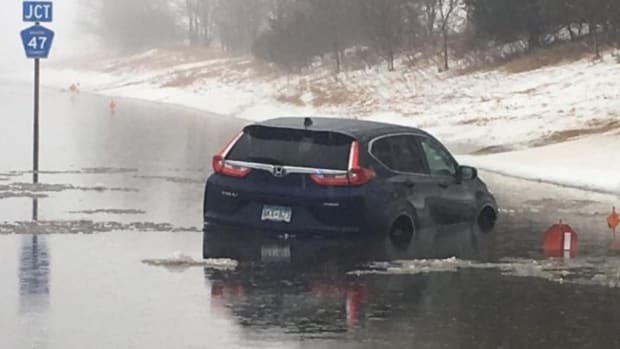 The weather service has also warned about an increasing risk of ice jams on rivers, creeks and streams, which can lead to rapid rises in water levels and flooding. It&apos;s what happened on Sand Creek in Jordan, causing around 150 homes in a mobile home park to be evacuated last week. MnDOT captured video of an ice jam forming on the Minnesota River at the Hwy. 99 bridge at St. Peter. The jam broke four hours later, but the river rose two feet during that time because of the jam. The guys from the Way Over Our Heads podcast have the situation covered. 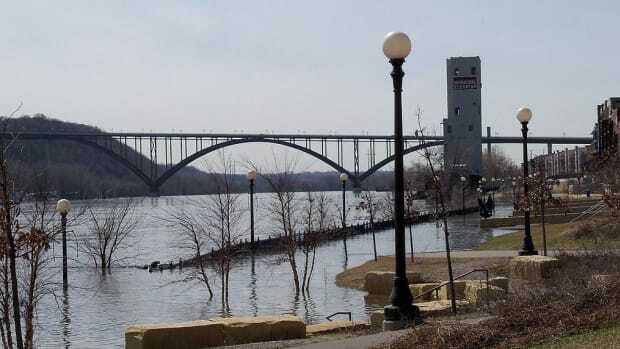 The Mississippi River is expected to swell to 20 feet. Canal Park is flooded and the waves could get bigger.